Originally uploaded by Jeremiah Owyang. Twitter – do you love it or hate it? I think your response to that question depends on why and how you use the application. This drives the type of content you’ll find valuable, the number of people you follow, and how you use text notifications and tracking. 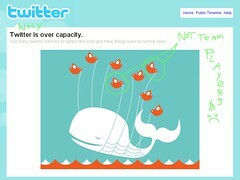 Giving the continuing technical difficulties that Twitter has been facing – apparently birds moving whales can be quite difficult – I’ve been getting less value from my network. I use Twitter as a heads up tool, to get advice, to connect with virtual communities, and to bridge communications from online to in-person (esp around events). I was following almost 1,000 people – so getting information was either serendipitous when tuning in or via @/DM. But I’m not getting text notifications like I used to. So, inspired by some conversations and posts with/from Mitch Joel, Greg Verdino, and Mack Collier, I’ve decided to shift the way I’m using Twitter to make the conversation more manageable. Similar to pruning my LinkedIn network, I unfollowed about 80% of my network, leaving only people whose names and/or pictures I recognized immediately, as well as people who I could remember having a helpful conversation with at some past point. To me, Twitter content works best when personal. Whether it’s something you’re doing or something you’re thinking. So I’m trying a new approach to Twitter, because I want to believe it’s useful. Maybe it’s just microblogging that’s useful and Twitter will ultimately pull a Friendster.